An Intro to the Ghana Life Stories Project! 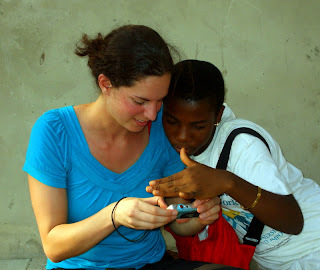 - Around the World "L"
An Intro to the Ghana Life Stories Project! At last, after a month of exciting classes and passionate writing, it is time to start sharing our Ghana student life story projects with you! Note: Each of these steps takes a different amount of time depending on your particular students. You may choose to do one step per class or bunch several together into one class. 1.) Introduce the Objective of the project: To create an engaging, detail-filled article about an important or influential event in your life so that readers around the world can peek into your life experience! 2.) Read and discuss an Exemplar article so students are aware of what you are aiming for. 3.) Pre-Writing Brainstorm 1: Possible Article Topics. Next, have them create a brainstorm web or wheel with at least five circles (or bubbles) with important life moments written inside them which radiate out from the central bubble. See the photo, below, for an approximation of what this should look like. By the next class, students should have at least ten brainstorm bubbles. Explain to students that an important moment can be something huge, like the first time visiting Accra, or a very happy or sad event, but it can also be something quite small like learning to cook banku with your mother. If students know each other well, pair them up for a five minute peer consultation where they look over each others’ brainstorms and suggest any events that are missing from them. 4.) Pre-Writing Brainstorm 2: Details of a Selected Event. Time to select the topic for the first article! Have students look over their topic brainstorms and select one that will be the subject of their first piece. Have them put a star next to it, then go around the class to share topics out loud. At the top of the paper, have students copy the following title: Things I saw, smelled, tasted, touched, felt, thought, heard (sounds as well as “quotes”), and learned. Next, have students write at least five bubbles in the web brainstorming these details about their chosen event. Refer back to the exemplar article to show how these details will be used in the writing and why they’re important in making the reader feel engaged in the article. Have students share some of their spiciest details aloud. By the next class, students should have at least ten bubbles on this second brainstorm web. 5.) Drafting: Using a Middle-Beginning-End Structure. Examining the exemplar article, note that an engaging article usually begins in the middle of the story, at the most exciting or shocking point, in order to grab the reader’s attention. Have students scan their second brainstorm to select the most thrilling lead moment. After giving some examples of good leads, have students write their article’s gripping first line, sharing some aloud. Demonstrate with the exemplar that after the lead moment, the article author must then go back in time to give the background details of the story, so the reader will not remain confused. Using examples, instruct students to craft a second paragraph which specifies their event location, their age at that time, who they were with, and what they were doing. Instruct students to ensure that in the last paragraph, the reader has some sort of closure. Though it doesn’t need to be tritely spelled out, there should be some sort of lesson or conclusion drawn from the experience explained in the article. 6.) Revising, Editing, Typing, and Formatting. This is the most difficult step to do with a large or rowdy class, because the ideal is to be able to move around and conference one-on-one with individual students while the rest chug quietly away on their individual or peer-helped writing processes. This is also the hardest step if your school has limited computers, as students will need to patiently wait their turn to type. But you will get it done! And once the first students have created and published their articles, it is very motivating for the other students to clearly see their goal. During this time, teach mini-lessons on common grammatical and conceptual errors you are noticing during one-on-one conferences. Ones I’ve seen here are verb tense confusion, and lack of adequate detail for the reader to really feel like they’re there in the moment. The final step is to format the articles, and to snap the glamorous author photos! So there’s the unit plan! Next stop: the first round of completed Ghana student life story articles! Your Comments Make Ghana Students Happy! Previous Post: « What the Heck is Fufu? 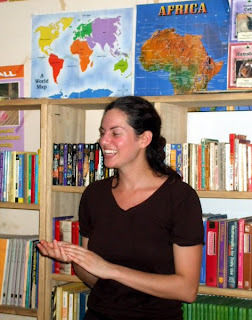 Wow, it is very fasinating to know that my Humanities teacher taught in Ghana. Teaching them different writing skills must have been a little difficult. Though this is very impressive. A lot of steps in writing to make the reader go into the story. This helps a lot of people who are struggling at writing. 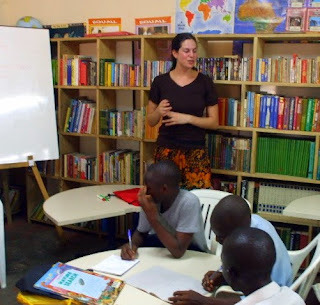 It is so cool to find out that my teacher actually worked in another school in Ghana, it looks like the kids have learned a lot! I also think it was really nice of you to do this and I bet the kids had lots of fun! This article is so interesting and it is so cool to see that my teacher was working in another continent. I read two articles and I am so interested to learn more about the differences between the U.S and Ghana. I think it is really nice that you did this because you can see all the kids happy and enjoying learning. I haven’t gotten a chance to read their writing yet but I just saw that some of them wrote about the trip to Cape Coast we took them on, I’m so excited to read all their stories I’m squirming in my chair! Thanks from the bottom of my heart you made my day Lillie! I’m unemployed right now but seriously the thought of going back there once I save up enough money is what drives me to go out and keep applying. Love the site btw. Happy traveling & stay safe!! Christina, how wonderful!!! I look forward to being in touch, and am glad you found this site! Looking back now this idea seems even better than I could have imagined! What a great contribution all the way around! Looking forward to the articles!